Americans are beginning to learn what Asians have known for centuries. Good health is created by a variety of herbal medications and therapies, psychological and therapeutic regimens, chiropractic interventions. There’s a lot more to staying healthy than simply relying on the practices of “western” medicine. In Okinawa, moxibustion and heat bath therapy are taking on a new life as people experience reductions in back and joint pains, and purge their bodies of toxins tucked away inside. The Ryukyu Heath Therapy Institute is in the forefront of alternative medicine practitioners introducing the techniques to foreigners. It may sound like jibberish to Americans conditioned to go only to standard medical doctors, but Katsuko Yabiku, the Ryukyu Thermo Therapy Institute Director, says it’s tried and true. She started the institute located in Nakagusuku, up the hill close to Nakamura House, in 1999. Yabiku has a doctorate in chemistry from the University of Hawaii, Honolulu, and she’s using her education, experiences and skills to better the health welfare of literally thousands in the seven years she’s been open. She’s also trained some 40 others, who now operate small therapy shops around Okinawa. Over the centuries, she says, thermo therapy has proven one of the best healing techniques, easing body pains and aches, while boosting the immune system. It is all proven, Yabiku notes, and points out that in her clinic, they’ve applied modern inventions to use those ancient techniques to maximum advantage. In a nutshell, the therapies use mixes of mineral ores sealed in rubber, then massaged against the skin in the same regimen as Chinese moxibustion. The patient feels the warmth, particularly where the blood circulation isn’t too great and causes muscles to spasm and ache. Heat causes the body to sweat, purging impurities and toxins, removing the pain. Ryukyu Thermo Therapy Institute offers two treatments; the heat bath is standard, while a second expands to treatment with ceramic artificial stones. Yabiku says treatments are inexpensive, at ¥3,150 for the basic service. The extended treatment is an additional ¥735. An optional blood analysis checking conditions of red and white blood cells—and photographed for you to see--runs ¥3,000. Reservations are recommended to avoid waiting, but Yabiku does take walk-ins. She says to bring two bath towels, some facial towels, boxer shorts or short pants, along for the treatment. Ladies should also bring a thin cotton tee shirt. If you forget, though, there are rental towels and disposable shorts. Patrons are advised to drink plenty of water prior to the treatment, to aid in getting the body sweating. All therapy sessions are in privacy of a room or cubicle, and take 40-50 minutes. 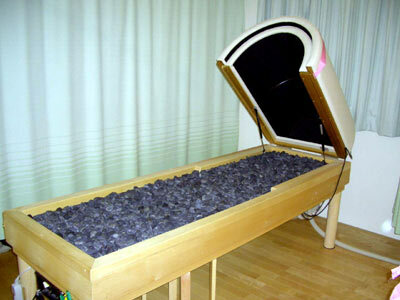 At conclusion of the massage, the therapist moves the treatment to a tubular infrared heat bed for another 20 minutes, followed by a massage with steamed towels in the last stage. 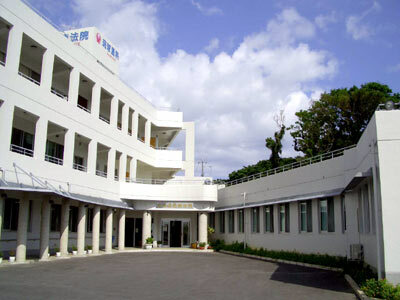 The Ryukyu Thermo Therapy Institute is located at 1147 Adaniya, Kitanakagusuku Vil., Nakagusuku. To get there, drive from Foster Legion Gate straight past Marine HQ and the entrance to Okinawa Expressway. At the next traffic light turn right and continue up hill until you see a three-story white building on your left. Large free parking is available in front of the building. For reservations, call 098-035-0075/0078.